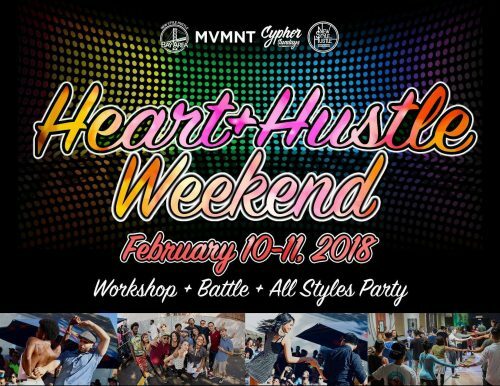 Excited to DJ for the Bay Area NSH Community with the homies Jayvi Velasco and Gwoeyn at Heart+Hustle Weekend. Lots going on, from workshops to party, to celebrating Cypher Sundays. It’s going to be another great weekend in the Bay. Robyn Baltzer is a Bay Area native who just moved back to the Bay after residing in NYC for 9 years where she pursued a dance career (Cirque Du Soleil), co-founded a dance movement (New Style Hustle) and opened a dance studio (The Spot Dance Center). She is happy to be back in the Bay and continuing to share her knowledge of New Style Hustle! A friendly open contest in a “Jack n Jill” format where contestants are randomly assigned partners and battle round for round. It is open to all levels and anyone who wants to have some fun! -Music by DJs Gwoeyn, Jayvi Velasco & Dennis Infante!! -Come hustle or just get down with us (All-Styles Welcome!) as we party for the night filled with fun, performances and dancing all night long! -Crew Performances by Hustle Communities from Los Angeles, The Bay Area & more! Cypher Sundays is a monthly street dance cypher that aims to explore iconic locations of Bay Area cities to capture freestyle dance in its purest form. We aim to cultivate raw street dance culture and capture pure freestyle moments through photography and video. We are a creative diverse group of dancers of all styles, ethnicities, and gender. This cypher is not about competition or fame, but purely to express and share our energy and inspire others for the love of dance.